Jobs: "Don't hold it like that." When reports began flooding in that Apple’s new iPhone 4 suffers from a serious antenna problem that disrupts voice and data signals, Apple fired back at its critics and competitors by claiming that all smartphones have the same issue. But do they? To see how common a problem antenna attenuation is, we took the iPhone 4 and five of its top smartphone competitors into the field to put Apple’s claims to the test. Here’s what we found. We tested five smartphones that compete with the iPhone 4: the HTC Nexus One (T-Mobile), the HTC EVO 4G (Sprint; not on 4G), the RIM BlackBerry Bold 9650 (Sprint), the Motorola Droid X (Verizon), and the Samsung Captivate (AT&T). First we measured each model’s signal strength when held normally. Then we tested each handset while holding it in its death grip--the position where our hand covered the phone's antenna most effectively. Because signal loss has far more severe real-world implications in environments where cellular coverage is already poor, we decided to test in a weak signal environment that we had previously identified in our ongoing testing of 3G network performance. The location we chose was Crestline Drive (Google Earth), near San Francisco’s Twin Peaks; we have consistently obtained poor coverage from all four of the major networks at this location. We measured signal strength in decibels per milliwatt (dBm), a standard way of expressing the power of a radio signal in relation to 1 milliwatt. In high-signal areas--for example, in locations where a smartphone user stands close to a cell tower--a signal measured at -51 dBm is the highest (and best) that can be achieved. In poor coverage areas, phones can connect and hold a call until the signal weakens to approximately -113, at which point the call drops and the network connection fails. To measure the real-world implications of signal loss, we tested both data speed performance and voice call quality. For data speed, we used the FCC-endorsed Ookla testing app to measure upload speeds and download speeds. We ran three consecutive speed tests on each phone at each location, and then picked the best upload and download speeds of the three. The voice-call tests were more subjective. We placed calls to a common local number, listening for static, jitter, delay, dropped calls, or failure to connect. We stress that these tests are informal, nonscientific and by no means definitive. Nevertheless, we believe that we got a very good look at the death grip in action, and a reasonably good idea of how legitimate Steve Jobs’s statements at the Antenna-gate press conference were. In its earlier tests of signal loss of the iPhone 4 when held, AnandTech found that the iPhone lost about 24 dBm of signal strength. In high signal areas, AnandTech surmised, the IPhone 4 can sustain a loss of 24 dBm and still maintain a clear voice call and a high-speed data connection. But in low signal areas, that level of signal loss can reduce the signal to a point where calls degrade and drop. So 24 dBm is the magic number--the standard measurement of the death grip’s effect on the iPhone, and the benchmark we used in looking at the phones we informally tested. Our results for signal loss due to death grip appear in the chart below. (Please click on the thumbnail to see the full-size chart). 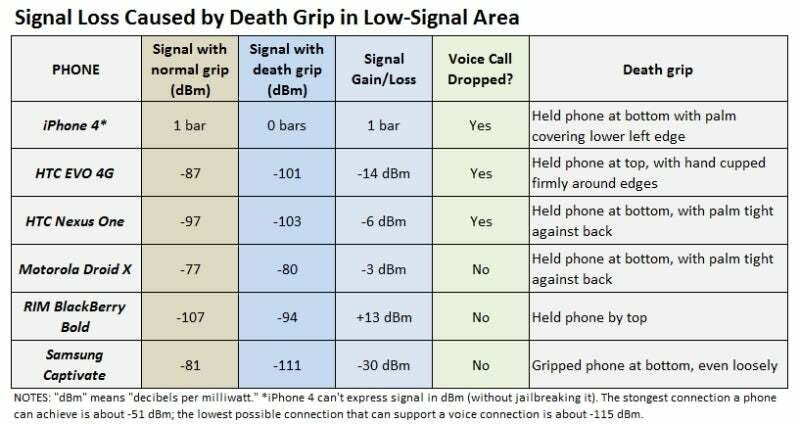 We measured death-grip signal loss by comparing the signal strength (in dBm) of each phone when held “normally” (flat in hand) to the corresponding signal strength (also in dBm) of the phone when held in a death grip (blocking the phone’s antenna). In our “weak signal” location, the Samsung Captivate on AT&T's service had the greatest amount of signal loss--even when we held the phone loosely at its bottom (where the phone's antenna is located). The Captivate dropped 30 dBm from -81 to -111 dBm. The HTC EVO was the next-most strongly affected by the death grip: Its dBm reading dropped from -87 to -101 dBm, a loss of 14 dBm--still far less than the Samsung suffered. The Nexus One and the Motorola Droid X each lost marginal amounts of signal strength in their respective death grips, with declines of 6 dBm and 3 dBm, respectively--nothing approaching the iPhone 4’s loss. Oddly, the death grip actually improved the signal strength of the RIM BlackBerry Bold by 13 dBm when we held the phone with our fingers tight around its edges. 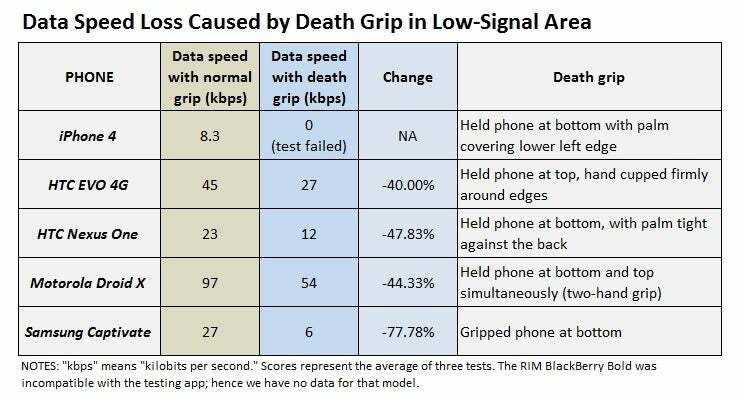 To understand the implications of the death grip on various phones, we looked for data speed decreases that seemed to result from it. We tested data speed loss on all phones except the BlackBerry Bold and obtained the results listed in the chart below (the Ookla test is not available from BlackBerry App World, and the alternative speed test application we used produced wildly inaccurate results). (Please click the thumbnail to see the full-size chart). Again, the AT&T-based Samsung Captivate experienced the worst drop-off of the non-iPhones we tested, sinking from a transfer speed of 27 kbps to a basically unusable one of 6 kbps--a 78 percent loss. The Nexus One, Droid X, and EVO 4G had closely bunched results, with death-grip-induced data speed losses of 47.8 percent, 44.33 percent, and 40 percent, respectively. In our test group, the Droid X delivered the strongest data speeds in our low-signal location, with an average of 97 kbps for the normal grip and 54 kbps for the death grip. The iPhone 4 completely choked in our data speed test. At first, we couldn’t get the speed test app to connect to its servers to run the tests. After a few tries, the test registered a speed of 6 kbps in a normal grip. But when we held the iPhone 4 in the death grip, we couldn’t get the testing app to connect at all--not even when we tried closing and reopening the application a few times. These findings tally with the results of our earlier informal tests of the iPhone 4's performance when held in its death grip, which we conducted when the phone had just come out. For another look at death-grip implications, we conducted some limited voice-call tests, listening for dropped calls or for calls with noticeable static or delay. Of all the phones in our tests, only the iPhone 4, the HTC Nexus One, and the Samsung Captivate showed significant signs of call quality degradation as a result of the death grip. Calls on all three phones sounded garbled, and on two of the phones--the Nexus One and the iPhone 4--we experienced dropped calls. Though it seems entirely plausible that an iPhone 4 user might hold the device in such a way that the grip would interfere with the antenna and reduce the phone's signal strength, the various death grips required to attenuate the antennas of the other phones we tested seem far less likely in the real world. For instance, the death grip for the EVO 4G involves cupping your hand around the top of the phone. You wouldn’t purposely hold your phone like this; it feels very awkward and makes accidentally hitting the volume buttons on the phone’s spine much more likely. Even more unnatural is the death grip for the Droid X: We had to use a two hands to grasp the bottom and the top of the phone simultaneously. Other death grips, though a little less exotic, still felt decidedly artificial. Holding your palm (or finger) over this break in the metal band around the iPhone 4’s edge can seriously compromise the performance of the phone's antenna. Part of the reason the iPhone is different is that Apple built its antenna into the metal housing that forms the outside edge of the phone. This represents a dramatic departure from the way most antennas are built into phones--namely, inside the shell and usually at the bottom of the phone. As a result, the iPhone 4’s exposed antenna is much more susceptible to interference (attenuation) from the hand of the person holding the phone. This risky (and apparently not fully tested) design move now looks like an epic fail--a cautionary tale that will be retold at drafting tables for years to come. 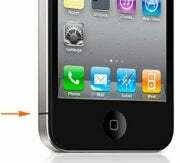 Apple’s assertion that antenna attenuation is a common problem on smartphones is clearly true. Every one of the phones we tested experienced some degree of attenuation when held firmly in a position that covered the device’s antenna. On the other hand, our informal tests indicate that different phone models do not exhibit attenuation to the same degree--and the iPhone 4 performed far worse when attenuated than did most of its competitors in our tests. Most significantly, the iPhone 4--almost certainly because of its “innovative” external antenna--was the only phone we tested that has a distinct (and easily reachable) weak spot capable of ending a call with a single touch. UPDATE: In order to present our test results more clearly, we have updated our story to express the effects of the death grip in actual dBm loss or gain, rather than as a percentage change.